"Dream in Color" Trunk Show May 8th-14th! Visit us at A Piece of Ewe from Tuesday, May 8th through Monday, May 14th to check out our "Dream in Color" Trunk Show! 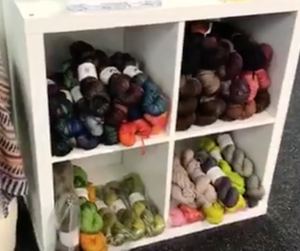 We have such a variety of beautiful yarn in the store that we can't fit it all in one spot! Stop by and you'll see Classy and Classy with Cashmere, which are fairly easy to work with worsted weight yarns. When you walk into our left room, you'll see Everest, which is a chunky, very fun yarn, and Cosette, a DK weight yarn. Both of these yarns are new to the store and are super squishy, soft, and so amazing to feel! 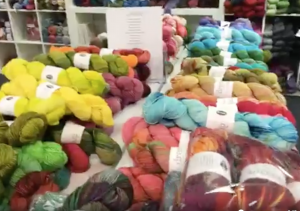 In the middle room where we usually keep our cotton and whatnot, you'll find the Smooshy sock yarn, Smooshy with Cashmere BFL sock yarn, BFL with Camel and Silk, and even more BFL Cashmere and Silk. When you walk out of the cotton room toward the middle of the main room, we've cleared off a display for more Dream yarn! This display has Jilly yarn, which is a fingerling lace weight yarn, which we usually don't carry. We also have the Jilly with Cashmere. Some of these have cashmere and some do not. Along with the Jilly sits the "Dream in Color" City yarn, which is a heavy worsted weight. We have kept these in packages for now but, as they come separately, you can get as much as you need. We have so much more yarn than we expected! We love the variety we have and know you will too! Stop by anytime from Tuesday, May 8th until Monday, May 14th to check out all of the amazing "Dream in Color" yarns. There's a little bit of something for everyone!